To see the full colour version of this week’s newsletter including photographs please scroll further down this page. You will also find there a full list of previous newsletters. This plain version of the newsletter will translate into different community languages using the Google translate button at the bottom of this page. Caterlink is an independently owned company. They are education catering specialists. Caterlink has a variety of quality marks including – Green Kitchen Standard, the Soil Association Organic Standard, Food for Life Catering Mark, Red Tractor Meat Standard. 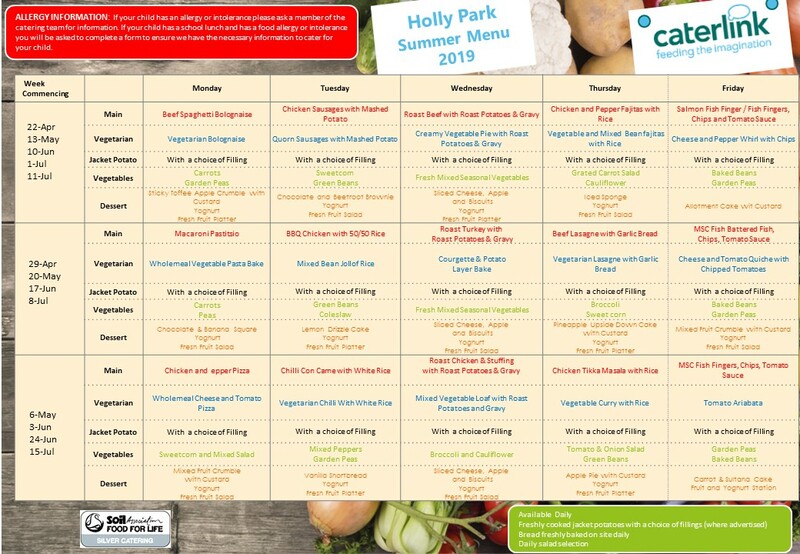 Caterlink offers 95% fresh food prepared on site and a Food For Life Silver Standard meal every day. As far as possible they use locally sourced foods. There will be 3 choices of main meal every day including a vegetarian option and a jacket potato and topping option. There will be a salad bar and home baked breads. There will be a dessert option every day including fruit and yoghurt. There will also be milk and water on offer every day. We will be moving away from the green flight trays we have at present, to separate plates and bowls from Y1 to Year 6. The new company are also keen to maximize pupil engagement so will also support the school curriculum by offering cookery sessions for children, food projects, competitions, healthy eating and wellbeing activities and fund raising activities – they will do one event per term. They will come into assemblies and talk about food. The company will also run taster events for parents. They will also ask for regular feedback about the meals from the pupils. Caterlink will of course cater for allergies and we will need parents of children with allergies to fill in a new form for their child. We will be celebrating British Values on Tuesday 23rd April – this is our first day back after the Easter holiday. We will be learning about a variety of British customs and traditions. We will also be learning more about British Values, Traditions, Iconic British Landmarks, famous people and British Events. We would like the children to come to school dressed as a famous Briton – artists, inventors, engineers, politicians, scientist, sports personality etc. They need to wear a label with the name of the person they are dressed as. We thought we would give you lots of advance notice. It seems that Holly Park is a bit of a trail blazer with Poppy our school dog. At a recent conference, educationalist Sir Anthony Seldon spoke about the need to improve young people’s sense of well-being. He commented that every school should have a dog or another pet to reduce stress. He told the conference, held at the Westminster Academy in West London, that it was no longer possible for schools to focus solely on academic achievement without thinking about the emotional well-being of pupils. Sir Anthony suggested a low-tech approach to reducing anxiety was the soothing presence of animals such as dogs. He commented that the quickest and biggest hit that can be made to improve mental health in schools and to make them feel safe for children, is to have at least one dog in every single school in the country. He said that because children can relate to animals when they are hurt and anxious and sad in a way that they can’t always with human beings…. the evidence is very clear that it works, and every single school – primary, secondary, special – should have dogs. Education Secretary Damian Hinds also said that more schools seem to have “well-being dogs” and “the pets can really help”. He commented that it wasn’t around when he was at school. He said that first he was a bit surprised, but actually it’s a great thing. He commented that for the children it can be really uplifting, particularly those that have different ways of expressing themselves and coming out of themselves – and the dogs can really help. An article in the Times newspaper last week also featured dogs in school and commented that well-being animals in school can really make for happier more focused pupils. It pointed out that research has shown that having a dog in school has profound and measurable outcomes. Recent research in Australia has shown that dogs in school can reduce stress, increase attachment responses and increase trust. It increased pupil motivation, helped those with emotional needs and led to increases in attendance. Well done to those who went to Coppetts Wood and supported Mrs Casey with clearing the area of so much rubbish. It was a great community activity to undertake. As a school we use the woods for our Forest School – so we would like it to be free of litter. They filled 46 bags of rubbish in a few hours. I would urge parents to really talk to their children about why littering is a really bad thing to do – how it makes an area look awful, dirty, smelly and very unattractive – how it encourages vermin – and is also not safe for wildlife and dogs who could eat it. I would like to think that Holly Parkers would not throw their litter on the floor. On Wednesday last week 6 boys and 2 girls took part in the Barnet East Year 4 football tournament. The standard of football was very high and Holly Park were in quite a tough group. The team managed 2 hard fought draws and 2 losses to finish third in the group but unfortunately this was not enough to progress to the knockout rounds. The whole team played really well and behaved impeccably. CHAMBER CHOIR (Years 5&6 Barnabas Choir): final Chamber Choir session of the term: April 2nd. Next term’s dates for Chamber Choir: 23rd April; 14th May; 4th June. Barnabas Choir (Years 3, 4 & 5) 25th June. Diary dates: Infant Choir Concert: Tuesday 30th April, 6:30 p.m. (No after-school Infant Choir sessions next term.) Chamber Choir will be performing at the Barnet Schools’ Music Festival – held at the Artsdepot Theatre, North Finchley – on Tuesday 18th June (7 – 9 p.m.) Barnabas Choir (Years 3, 4 &5) summer concert will be held at school on Wednesday 10th July, 7 p.m. HOLLY PARK MUSIC BLOG This contains many of the songs we are learning in our choirs. It may be accessed via the school website (Music and Choirs: Holly Park Music Blog). Despair – the complete loss or absence of hope. We now have a Community Noticeboard on our school website under the ‘Contact’ heading. This is for parents and friends of the school to advertise their businesses/events. For example if you make birthday cakes, do nails, are a decorator etc. The following rules will apply: Items will be listed alphabetically to avoid any favouritism eg C for cake making, P for Piano lessons. There is a disclaimer at the top of the page saying that inclusion on the page does not mean the service is endorsed by the school in any way. The cost to advertise will be £10 per term paid to Mrs Hassan. We no longer distribute leaflets for companies advertising holiday clubs, tennis lessons etc as this is not very eco friendly. However the company can email the school office a leaflet and for £10 can advertise on this page.